Ремені, які забезпечать комфортне та безпечне положення тіла в автомобілі. A Spinal Belt constitutes the foundation for the other parts of the system and is always fitted first. 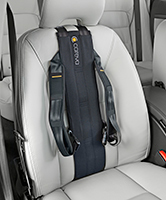 Place the belt around the car seat and secure it at the back of the seat. The belt is adjustable, adjust until safe. 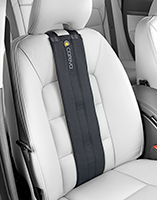 The Shoulder Harness is used in the same way as the Thoracic Belt to fix the upper body and to prevent the person falling. 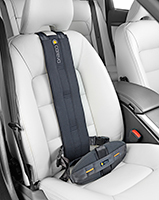 The belt offers greater support for the shoulder and uses buckles to secure at the side. 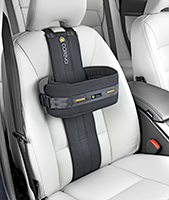 The Combi Harness is a combination of a Shoulder Harness and a Pelvic T-belt and the shoulder straps are fastened on the front rather than the side as the standard Shoulder harness. The circumference round the chest determines the length of the belt. 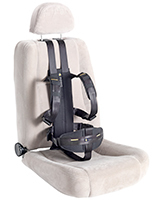 The Thoracic Belt is used to position the upper body and prevents the person falling forwards or to the side.